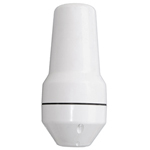 In order to connect the outdoor antenna with the docking station or your telephone, you still need additionally another antenna cable and the antenna adapter fitting for your telephone. The antenna cable is available in the lengths of 5, 10 and 20 m (16.4, 32.8 and 65.6 ft). A suitable mounting plate for attachment is not part of the scope of supply. In DIY markets available galvanized 3/4 inch water pipe with suitable clips for attachment can be misused however marvelously.